ETF SPY: iShares Silver Trust (SLV) – Where is Support? From peak to trough and in a little more than two years, silver has lost 63% of its value. The iShares Silver ETF (SLV) would be an easy avenue for investors to capitalize on a possible powerful counter trend bounce. But where is the kind of support that will serve as a springboard? The iShares Silver Trust (SLV) is trading lower today than 5 ½ years ago and has lost 63% since its 2011 bubble high. How low can it go? Some may still be licking their wounds from trying to catch the latest ‘falling knife,’ but it’s always an interesting challenge to see how much farther prices may go. The chart below shows that silver prices stopped at an interesting trend line intersection today. Double trend line support like this is known to temporarily halt declines, buoy prices and even lead to sizeable rallies. More serious support however lies beneath Thursday’s low. The 78.6% Fibonacci retracement of the points gained from the October 2008 low to the April 2011 high is at 16.99. General support created by a sideways basing pattern (green stripe) in 2010 is also right around 17. Normally the 17 range should be considered strong support and possible spring board for a spirited rally. However, keep in mind we are talking about the silver ETF, not silver prices. 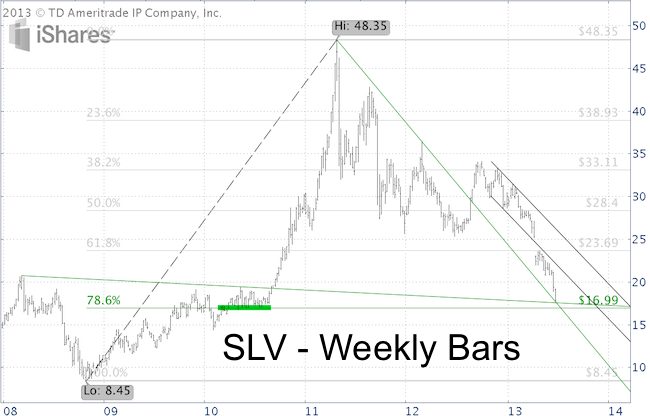 SLV, the silver ETF, is within striking distance of its 78.6% Fibonacci Retracement support. Actual silver prices are still about 8% above its respective 78.6% Fibonacci retracement. Which one – silver ETF or actual silver prices – will be right? Only time will tell. I base my technical analysis on actual silver prices, because it’s a truer representation of the broad market. Regardless of your preference, one of the outlined support levels is likely to serve as a springboard for a powerful relief rally. Things aren’t always what they seem. That’s certainly true with the golden VIX cross. It sports an absolutely flawless record since 2008. However, digging deeper reveals the flaws of this seemingly flawless indicator. Golden crosses or ominous death crosses tend to grab Wall Street’s attention. The CBOE Volatility Index or VIX just saw a golden cross. A golden cross occurs when the 50-day simple moving average (SMA) crosses above the 200-day SMA (a death cross occurs when the 50-day SMA drops below the 200-day SMA). A golden cross for stocks, indexes or ETFs is generally considered a bullish development. Since the VIX serves as a fear barometer (the higher the VIX, the more fear), a golden VIX cross is actually considered bearish for stocks. 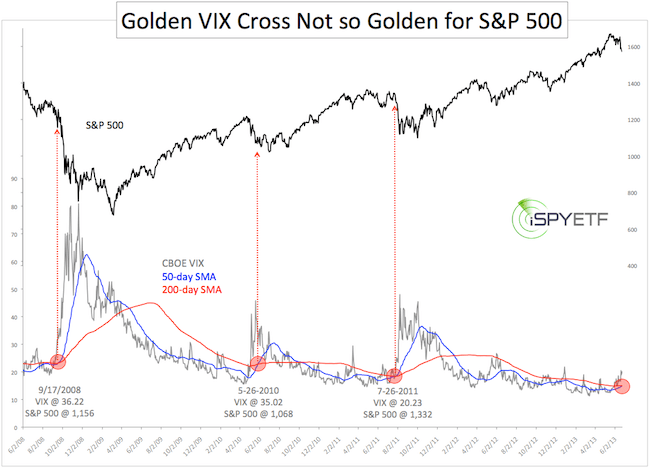 Since 2008 a golden VIX cross has foreshadowed lower stock prices 100% of the time. As the chart illustrates, the 50-day VIX SMA crossed the 200-day SMA on 9-17-2008, 5-26-2010 and 7-26-2011. One month later the S&P 500 traded lower every time. In 2008 and 2011 the S&P 500 losses easily reached double digits. Based on analysis going back to 2008 the golden VIX cross is a definite negative for stocks. There were 24 golden VIX crosses from 1987 – 2007. Unfortunately, that’s too long of a time span to easily illustrate via a chart. Nevertheless, a thorough examination of those 24 instances reveals no bearish implications for stocks. In fact, buying the VIX (or selling the S&P 500) based on the signals prior to 2008 would have racked up more losses than gains. Such a poor track record is not surprising. After all the VIX is mean-reverting, so betting on the continuation of a trend suggested by a long-term moving average is counter intuitive. While I don’t base my analysis on the VIX golden cross, the general behavior of the VIX, the S&P 500 and Treasuries may suggest that the nature of the market is changing and that lower lows are still ahead for stocks. >> click here to test drive the Profit Radar Report. Years of rising prices have conditioned investors not to fight QE. The recent stock market correction was expected and is nothing out of the ordinary, but the performance of Treasury should raise eyebrows. Are the days of “Don’t fight the Fed” over? Obviously it’s too early to tell, but a comparison between the SPDR S&P 500 ETF (SPY) and the iShares Barclays 20+ Year Treasury ETF (TLT) reveals a new twist. 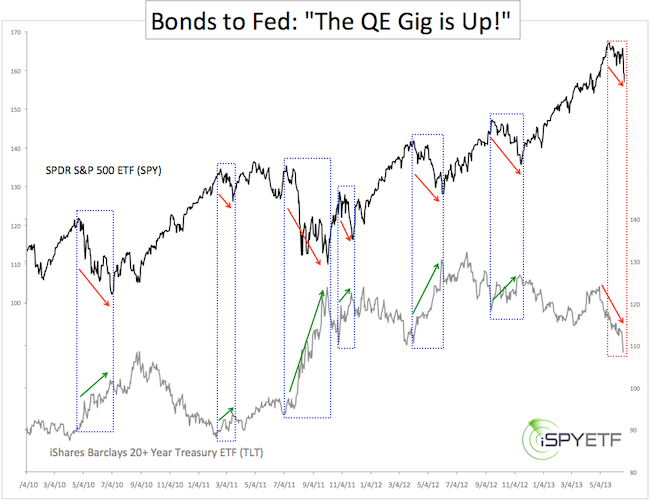 Long-term Treasury bonds might be telling the Fed: “The QE gig is up!” Why? Stocks and bonds generally have an inverse relationship. When stocks go down, bonds go up and vice versa. The blue boxes in the chart show that TLT rallied every time SPY declined by more than 5%. Since early 2010, when investors dumped stocks, they stocked up on bonds. When confidence in stocks ebbs, confidence in bonds flows. Since the May 28 high, SPY has fallen as much as 7.9%. At the same time TLT has lost as much as 9.1%. Yes, long-term Treasuries got hit harder than stocks. What does this mean? In short, it’s a warning shot across the bow. The Federal Reserve has been funneling QE-money into purchases of its own Treasuries. This (until recently) has kept prices afloat and interest rates low. The fact that investors are dumping Treasuries despite falling stocks is an early warning sign that they have lost faith in the Federal Reserve’s ability to artificially prop up prices. It is said that bond investors are smarter than stock investors and bond investors seem to have lost trust in the Fed’s QE. If bond investors’ suspicion spills over into the stock market, watch out. The S&P 500 Index triggered a beautiful ‘kiss good bye’ signal on Tuesday, before Bernanke spoke and sunk stocks. Interestingly, the sell signal for the S&P 500 could not be seen in the chart of the SPDR S&P 500 ETF (SPY). SPY S&P 500 ETF or S&P 500 Index. What’s the difference? It’s like tomato or tomato (imagine the second ‘tomato’ spoken with a British accent). I always try to base my analysis on the purest representation of any given index or asset class. When it comes to the S&P 500, the purest representation is the actual S&P 500 Index you always see quoted. The SPDR S&P 500 ETF (SPY) tracks the S&P 500 very closely, but even minor variations can make a major difference. The first chart below shows the S&P 500 parallel channel referred to in the Profit Radar Report (if you aren’t a subscriber, I tweeted a close up picture of this channel on Tuesday). 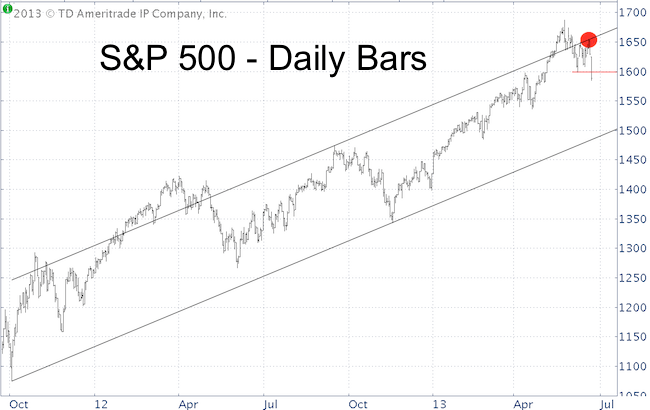 Drawn in the second chart is the exact same parallel channel for the SPDR S&P 500 ETF (SPY). 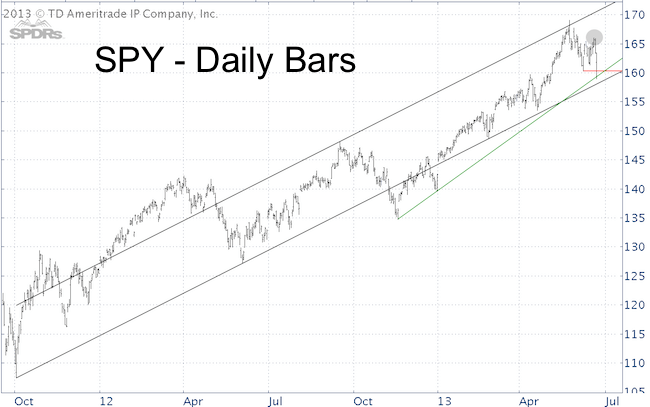 However, unlike the S&P 500 Index, SPY’s channel is placed differently. There was no kiss good bye for the SPY ETF. Key support (red line) was broken for both, when prices dropped below the June 6 low (160.25 for SPY and 1,598.23 for the S&P 500). The SPY chart allows us to draw a support trend line (green line) that’s unique to SPY. I wouldn’t say there is a clear winner in the SPY vs S&P 500 debate, but I prefer to base my S&P 500 technical analysis on the S&P 500 chart. It’s as pure as it gets. Why further down side is still ahead, what the down side is, and why stocks will rally again when this is all over is discussed in Thursday’s special Profit Radar Report. On Thursday, gold prices tumbled to the lowest level since September 25, 2010. After a 33% slide, the SPDR Gold Shares (GLD) – once the largest ETF in the universe – is officially in bear market territory. Why? Will it last? Not everything that shines is gold and even the real stuff is worth much less today than yesterday, or any other day since September 2010. Gold, the last honest asset and conscience of the financial world, reminds complacent investors of a time-tested but forgotten principle: What goes up must come down. 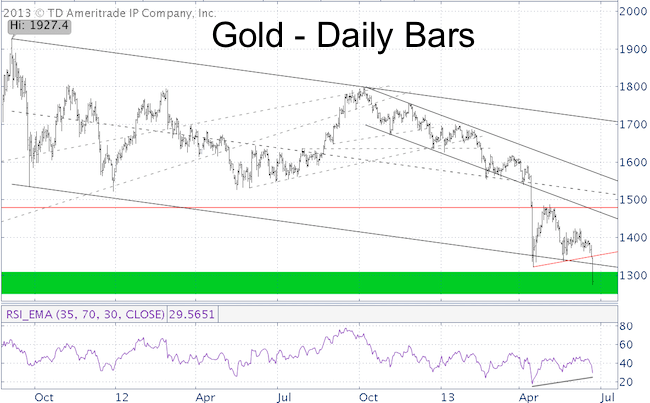 Gold’s fate has been a frequent topic of discussion in the Profit Radar Report. Ever since the April 16 low of $1,321/oz, the Profit Radar Report has been expecting a new low in the 1,250 – 1,300 range. One reason to look for new lows came from a basic but reliable indicator – RSI (Relative Strength Index). There was no bullish RSI divergence at the April 16 low. Weeks of sideways trading allowed RSI to reset and hold up much better than prices. A bullish RSI divergence is now in place (see chart). The CBOE Gold ETF Volatility Index (GVZ) also suggested a new low. GVZ basically is a VIX or ‘fear barometer’ for the Gold ETF (GLD). The chart below plots the SPDR Gold Shares (GLD) against the CBOE Gold ETF Volatility Index (GVZ) and provides an update to the chart featured in the April 16 Profit Radar Report. The December 2011 bottom was accompanied by, what I call, a volatility divergence. Volatility at the initial September 2011 low was much higher than at the December 2011 low. 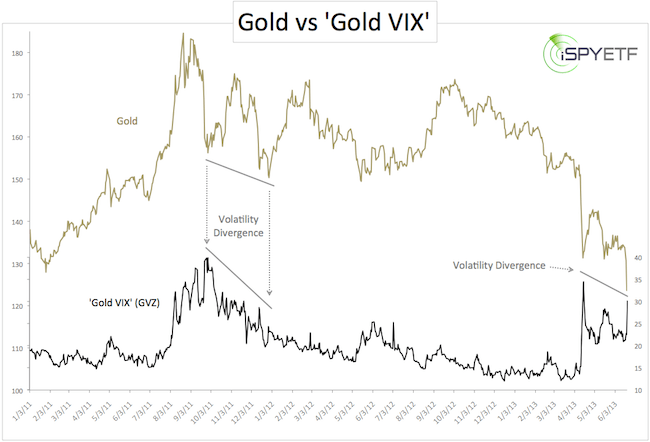 Volatility divergences are not unique to the gold market. In fact, similar volatility divergences helped me identify major stock market lows in March 2009, October 2011 and June 2012. Yesterday’s new low for GLD and gold prices was accompanied by such a volatility divergence. Based on technical indicators, the conditions are in place for a low. Investor sentiment is extremely bearish, which is conducive for higher gold prices. However, we need to remember that gold has been in a 10-year bull market and therefore should not overvalue the current sentiment extremes. 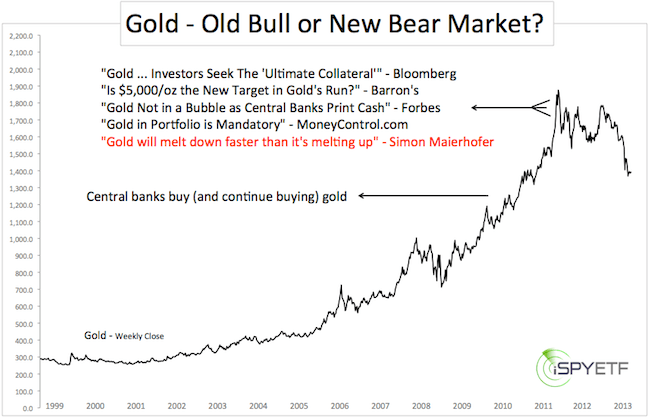 The fact that gold prices haven’t been able to get off the mat in weeks, despite bearish sentiment extremes, suggests that gold has entered a new environment – it used to be called a bear market. Regardless, we expect some sort of a gold bottom in the 1,250 – 1,300 range with the potential for a powerful bounce. The conditions are right to start fishing a bottom, but there’s no reason to be careless. Lower price targets are still possible. The focus of the Profit Radar Report will be on finding low-risk buy levels that gives us all the benefits of a nice rally without any of the pain of being wrong or too early. The Federal Reserve has become somewhat of a financial super hero. Sure, it’s not acting in everyone’s best interest (unless you’re a big bank), but it has the air of invincibility. But invincibility is a fickle thing and gold is showing Bernanke how fast it can be lost. When looking at various markets, I often search for investment themes or trades that seem too obvious. Why? If it’s too obvious, it’s obviously wrong. One of the obvious beliefs today is the power of the Fed to control markets. It has become a foregone conclusion that Fed stimulus lifts stocks. The only concern is when the Federal Reserve will start withdrawing the punchbowl. 1) Despite Japan’s historic stimulus, the Nikkei dropped 23% in eleven days. That’s not what “Abenomics” was supposed to look like. 2) Gold prices plummeted over 30% (including the worst meltdown in decades) at a time when central banks were buying the yellow metal at record pace. Not as an immediate forecast, but as a general investment lesson we should review the sentiment leading up to gold’s all-time high. I will use media headlines to chronicle the ‘great gold rush’ of 2011. On August 26, 2011, the SPDR Gold ETF (GLD) becomes largest ETF with $77.9 billion in assets. The moral of the story is that even deeply entrenched convictions are eventually overthrown by ‘unexpected’ events that should have been expected simply because they were so unexpected. When it comes to stocks in a QE market, good news is good news and bad news is good news. If the economy is getting better, great. If it’s getting worse, no sweat, we’ll get more QE. Here’s one ‘monster’ reason for getting more money from the Fed. One more day and we’ll get another crack at deciphering chairman Bernanke’s cryptic phraseology. Will the Fed dial down QE spending? One ‘monster’ indicator looks so bad, it’s good for stocks (bad news = more reasons to keep QE going strong). Bernanke linked the quantity and longevity of QE directly to the labor market. The current headline unemployment rate is at 7.6%, down from 10% in October 2009. Although the headline number is moving in the right direction, many smart people have pointed out that this is only a statistical improvement caused by a shrinking workforce. Adjusted for population, fewer Americans now work than at any other time since 1979. The improving number also doesn’t reflect workers that had to settle for jobs that only pay a fraction of their pre-crisis salary/income. 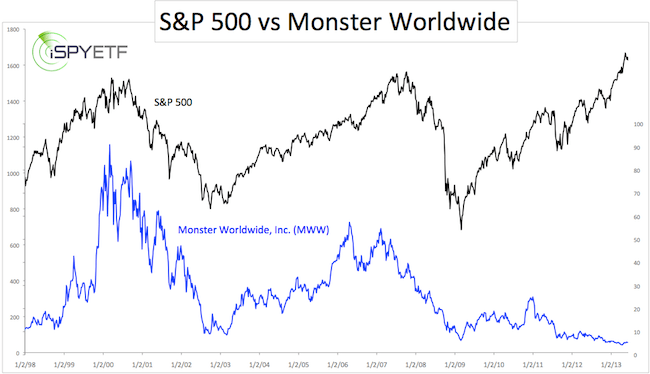 The chart below plots the S&P 500 against a company with its finger on the pulse of the job market – Monster Worldwide, Inc. (MWW). Monster connects employers with job seekers at all levels in the Americas, Europe, and Asia. The company provides solutions and technology to simplify the hiring process for employers. Admittedly, there are a number of non-job related reasons that may affect Monster’s stock price, but what explains the 90%+ drop from 55 in 2007 to 5.25? It’s probably not much of a stretch to assume that the actual job recovery is not quite as strong as the unemployment numbers suggest. Could it be that Mr. Bernanke receives many exclusive gift baskets from our friendly neighborhood too big to fail banksters stuffed with expensive wines, charts like this, and the petition to keep the free money coming?